Last month, Lionsgate announced that it was bringing two of its most anticipated movies to New York Comic Con in one exciting panel showcasing Power Rangers (March 24, 2017) and John Wick Chapter 2 (February 10, 2017). For those who can't be at the Javits Center today, Twitch has set up a live stream of this entire panel, which you can watch below from the comfort of your own home. We'll also be debuting the new trailers for each of these movies as soon as they're released. Lionsgate will host a power-packed panel that will feature the stars and filmmakers from the highly anticipated feature films John Wick: Chapter 2 and Saban's Power Rangers during New York Comic Con on Saturday, October 8. 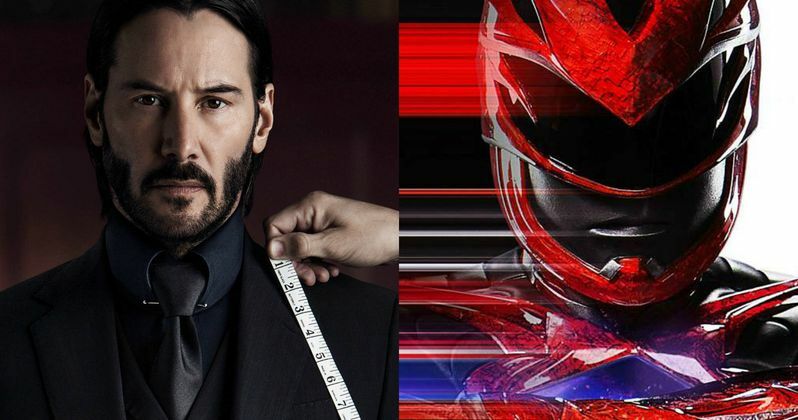 Fans attending the hour-long panel will be treated to Q&A sessions with the cast and producers of Saban's Power Rangers and John Wick: Chapter 2, as well as exclusive, never-before-seen footage from both films. Those who cannot attend will be able to watch the panel LIVE on Twitch, with the live stream video player embedded below. Twitch will also be live streaming several other panels throughout the day, which you can watch in this player. Keanu Reeves will be appearing at NYCC along with other John Wick 2 cast and crew. There, a Q&A will take place along with the first ever footage of this sure to be action-packed adventure. Lionsgate had this to say about the event. This sequel finds legendary hit man John Wick (Keanu Reeves) squaring off against some of the world's deadliest killers in Rome. The film will also serve as a reunion for Matrix stars Keanu Reeves and Laurence Fishuburne, who plays a character called the Bowery King. Also starring in John Wick Chapter 2 are Common, Ian McShane, Ruby Rose, Riccardo Scamarcio, Peter Stormare, John Leguizamo, Bridget Moynahan, Thomas Sadoski and Lance Reddick. John Wick: Chapter 2 will be in theaters on February 10, 2017, just in time for Valentine's Day. Power Rangers stars Becky G (Yellow Ranger), Naomi Scott (Pink Ranger), RJ Cyler (Blue Ranger), Dacre Montgomery (Red Ranger) and Ludi Lin (Black Ranger), with Elizabeth Banks also starring as the villainous Rita Repulsa. It was also recently confirmed that Bill Hader will provide the voice of Alpha 5, while Bryan Cranston will portray Zordon in this remake, which has been set for release on March 24, 2017. It was also recently confirmed that none of the Mighty Morphin Power Rangers original cast members will have cameos in this reboot. This new update of the Power Rangers TV show follows five ordinary high school kids who must become something extraordinary when they learn that their small town of Angel Grove, and the world, is on the verge of being obliterated by an alien threat. Chosen by destiny, our heroes quickly discover that they are the only ones who can save the planet. But to do so they will have to overcome their real-life issues and band together as the Power Rangers before it is too late. Take a look at the video player below to watch the live stream of the John Wick 2 and Power Rangers NYCC panel.